When you were young, do you remember the feeling of seeing a great family film? The ones that centred around animals or creatures? At five years old, I would watch such films and think, ‘how did they get that creature to do all those things?’ That’s the feeling I had on seeing Paddington for the first time. Despite my knowledge of CGI and fur rendering, the small Peruvian bear felt real and I left the cinema with a feeling of wonder. The news of a sequel to the 2014 hit left me with excitement and dread. In a year of sequels that were not as good as the originals, (Guardians of the Galaxy Vol. 2). Sequels that felt irrelevant (Alien: Covenant) and the sequels that were just God awful (Kingsman: The Golden Circle) how could Paddington 2 compare? Luckily writer, director Paul King has not only delivered a strong sequel but may have surpassed the original. Once again featuring Hugh Bonneville, Sally Hawkins, Julie Walters and Ben Whishaw as the voice of Paddington bear. Joined by newcomers Hugh Grant and Brendan Gleeson. We pick up with Paddington a short while after the events of the first film; the small bear is happily settled in with his loving family the Brown’s and a beloved addition to his community. With his Aunt Lucy’s birthday approaching, Paddington wants to buy her the perfect present. He finds an antique pop-up book of London, the city she never got to visit. To pay for it, Paddington works odd jobs but before he can purchase the present, it is stolen! With Paddington blamed for the crime it’s up to him, The Brown’s and all his new friends to prove his innocence and unlock the mystery of the pop-up book. With the success of the first film it was no surprise that writer, director King returned. This time he is joined by co-writer Simon Farnaby, who also has a cameo in both films. David Heyman returns as producer and with Harry Potter and Fantastic Beasts on his CV, the man is no stranger to sequels. Similar to the first film, the franchises strongest trait is that is focuses on the simplest of details. Originally Paddington wanted to find a home and here, he wants to buy his Aunt Lucy a present. From this elementary plot, King creates conflict, humour, character development and tenderness. What King has done so brilliantly in this film is give every character their own arc. Mr Brown’s work life, Judy’s break-up, Robert’s new school image. King’s TV background is put to brilliant use making every character relevant. Even newspaper sellers have a purpose in this story and watching the characters band together to save Paddington, will fill any audience member with pride. Once again, the film so brilliantly makes London a character. From an opening sequence of Paddington taking an interesting route into Mr Grubers shop, to an epic chase scene involving a stray dog and a Goose. The film’s version of London may be rose tinted but in Paddington’s world, it feels plausible. Ben Whishaw reprises his role and lends his tender vocals to Paddington. Here we see a more vulnerable side to the small bear, when his home and family are taken away from him. Whishaw plays Paddington with equal amounts of cuteness and innocence. Hugh Bonneville and Sally Hawkins once again head the Brown family. The relationship here is stronger with both seeing Paddington as a member of the family. Mr Brown also faces a midlife career crisis and a scene with him on two trains will have audiences in tears. 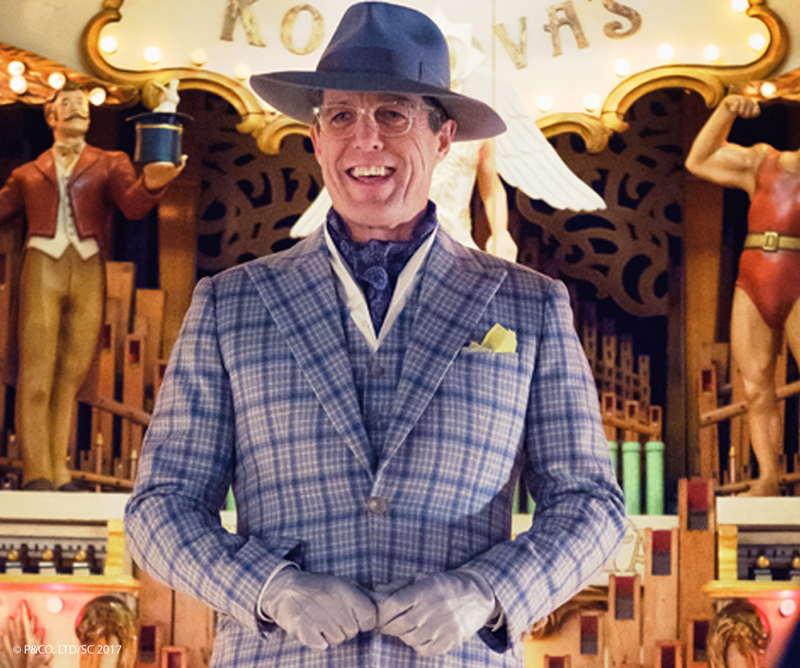 Within the strong ensemble cast, it is new addition Hugh Grant who really steals the show as Phoenix Buchanan. In contrast to Nicole Kidman’s icy villain Grant plays over-the-top, narcissist, and performs pantomime to a tee. There is more interaction here between Paddington and Villain which gives the film more edge. His motives are pure adventure fantasy and create added mystery in the film. The kind of film the world really needs at the moment. The film makers have excelled in bringing Paddington and the Brown’s back to the big screen for his second outing. Paddington 2 is smart, warm and a brilliant dedication to the late Michael Bond’s memory. Paddington 2 is out in cinemas 10th November!